The highlighted words, open new windows with additional photos etc. 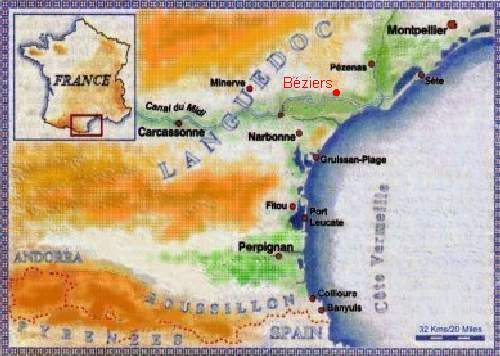 Béziers is situated at the heart of the largest vineyard in the world, the Languedoc Roussillon, and is the capital of wine for the region. The wines of St Chinian, Corbières, Minervois and Faugères now count as some of the finest to be found in France. Béziers is a beautiful town, it has many squares with pavement cafés and restaurants, good shopping , a covered market, Les Halles, open every day except Mondays, with superb fresh fish, cheese, paté etc. There are also a variety of outdoor markets every week. Béziers has a magnificent Cathedral and other Historic Buildings, Art Galleries and Museums. It is the birthplace of Pierre Paul Riquet, the builder over 300 years ago, of The Midi Canal, a truly magnificent engineering achievement which connects the Mediterranean with the City of Toulouse. The canal is now a paradise for cruising and leisure, and it is possible to hire a boat for the day, or dine out on a restaurant barge. Another famous son of Béziers was Jean Moulin, the leader of the French Resistance during WW2. My journey from that delectable spot (Carcassonne) lasted a couple of hours and was performed in darkness - a darkness not so dense, however but that I was able to make out, as we passed it, the great figure of Béziers, whose ancient roofs and towers, clustered on a goodly hill-top, looked as fantastic as you please. I know not what appearance Béziers may present by day, but by night it has quite the grand air. Béziers is close to a coast lined with beaches, some just wild sand dunes, others with all the facilities of seaside towns. Inland lie the mountains and lakes of the Haut Languedoc Regional Park to the north, and the wild Corbières to the south, both wonderful for exploring and walking. Béziers has an excellent Golf Course and for those of you who are looking for an active holiday there is river canoeing, fishing, and wind surfing on saltwater lakes The Étangs. Throughout the year, there are concerts and theatrical events taking place in and around Béziers. Béziers lies midway between Carcassonne and Montpellier, which is the capital city of the Languedoc region of France and a very beautiful University town. The Faculty of Medicine is the oldest in Europe where Nostradamus studied and taught. Carcassonne is the largest Medieval Walled City in France (and the third biggest tourist attraction !!) Other towns in the region are Narbonne (the ancient Roman Capital) and Albi, (with its magnificent Cathedral), birthplace of Henri de Toulouse-Lautrec and has the largest collection of his paintings in the world. Nearby is the small town of Pézenas, ancient home of the Etats Généraux du Languedoc and where Molière came to success, before returning in triumph to Paris.